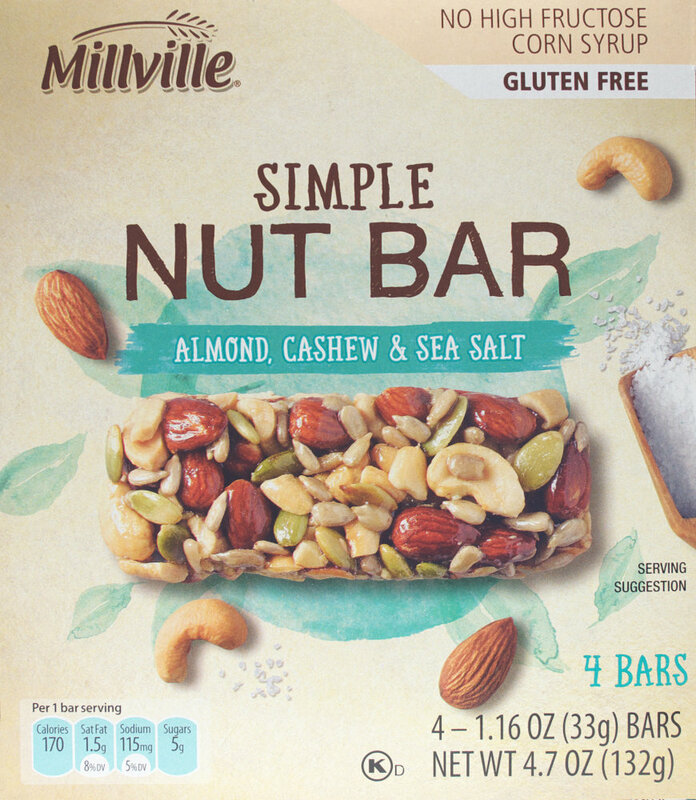 That’s exactly what this is, a simple nut bar. It’s almost nuttin’ but nuts held together with just enough gooey stuff to make a bar. There’s a little bit of sea salt added in, but not enough to be very salty. There’s no chocolate coating or drizzle. Some dark chocolate would’ve been nice in my opinion. But it’s still good without. The nuts are large and identifiable by species, just in case you’re into matching up the ingredients to the label. Oooh, there’s a cashew! As far as snack foods go, this may be one of the healthier/better alternatives. There are relatively few carbs, 11g (3g of that is fiber – not bad). There’s some protein, 5g. The majority of the calories in the bar come from fat, 12g. Of course that fat comes from plant oils in the nuts (and some from the vegetable oil used for toasting(?) 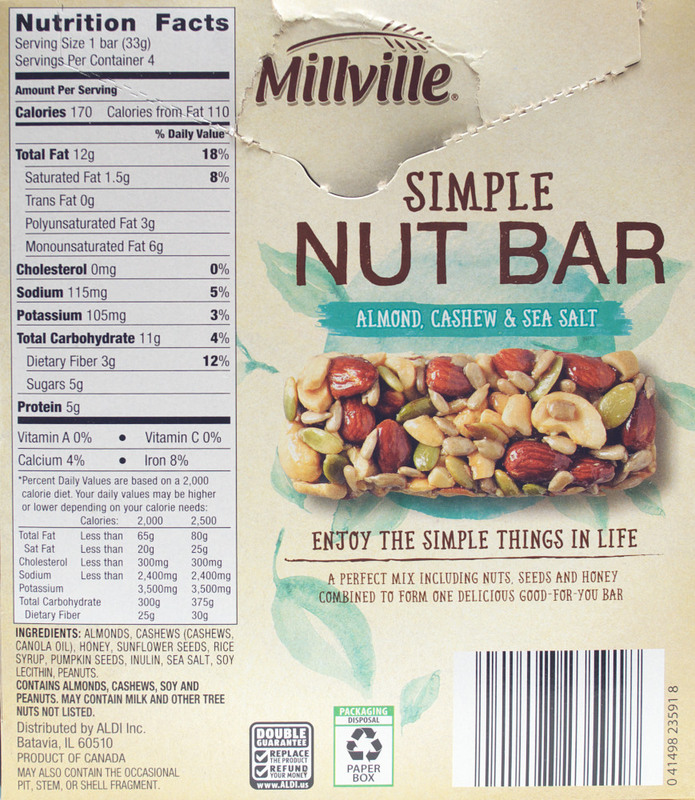 the cashews – that’s an interpretation of what the ingredient label says). If we believe what we read elsewhere, plant oils are typically a better fat than animal fat. Since the bar is slightly smaller, 4.7 oz. (132g), versus some other similar bars, there are a few less total calories. This entry was posted on 03/11/2017 at 22:10 and is filed under ALDI, food, Recipes, food, cooking and related items. You can follow any responses to this entry through the RSS 2.0 feed. You can leave a response, or trackback from your own site. I share your wishes! Here’s the ALDI customer contact URL. Hopefully they’ll listen and send a few to my ALDI store also. I hope these bars become permanent at Aldi, they are the best, went to look for more and sadly they were already all gone, bring back more to the Bedford IN store. Gone as of today’s shopping trip. Love these, can’t find them now. Will they be coming back anytime? Thanks for your comment. I’m hoping they come back also. Yes they are so good. How can we get more ? Love them!!! Please bring this nut bar permanently to Aldi! Would like to buy more, but sadly, they are not available. Yes sadly, they appear to have been a weekly special. Maybe they’ll be back some day?